Walking by the art gallery Rebecca was lost in thoughts of her daily life. 'What a wasted life - the artist in me has died' she brooded. 'My life is all about duty' she said looking at the famed replica. 'And look at you – smiling for centuries’. Rebecca’s mobile was buzzing, it was from an unidentified number. She disconnected it a couple of times,but the caller persisted,finally she took the call. 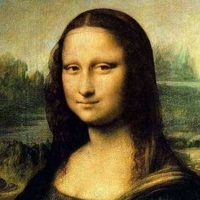 Trembling, Rebecca looked up at the painting again – Monalisa was smiling.